'Stingray' was a fitting description. For - in the hands of the unwary - the Corvette could unleash a fierce sting. Fibre-glass bodywork - avant-garde, at the time - meant the Stingray was a lot lighter than you might expect! Add to that a big-bore engine - and high compression ratio - and the result was a power-train that required respect. Inspiration for the Stingray's free-flowing form came from the Mako Shark 'dream car'. Dream cars were just that. Conceptual exercises, they were never intended to traverse highways - but, rather, to work buyers up into a fever-pitch of excitement! Their hey-day was the 1950s - when science fiction was the source for some truly 'fantastic' designs! Due to its hour-glass shape, the Stingray was dubbed the 'Coke bottle'. Andy Warhol would have been proud. 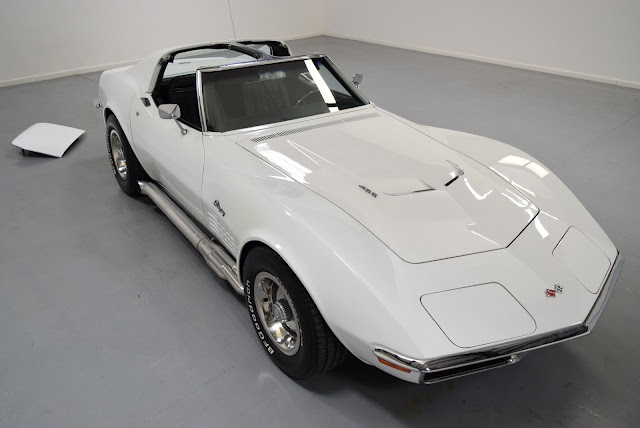 American to its apple-pie core, the Chevrolet Corvette Stingray summed up a nation ... and its Sixties dreaming!